The Pak-India affair is almost as tiresome as the Israeli-Palestine impasse. Neither party can pull apart nor do they live together in peace. Successive governments on both sides start a peace initiative at the beginning of their terms, only to lapse into status-quo near the end-defeated by the inertia of babus and elite interest on both sides. For most of India, south of the Vindhayas and East of the Yamuna, Pakistan remains a distant and intractable land. For the average Pakistani, India is a bully, growing muscular by the day, bent upon destabilizing Pakistan. It doesn’t help that for all practical purposes, Pakistanis and North Indians are very alike. They share the same values and prejudices. The daily “show” of faux aggression at the border post of Attari, near Amritsar, illustrates the brawny culture on both sides. 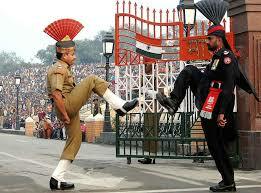 Border guards on both sides face off in a peculiar, mirror image, “Punjabi Tango” of choreographed, muscle and moustache to the accompaniment of lusty words of encouragement of their country people. But the bravado ends tamely, with both sides trotting off to their own quarters, their duty done. The similarities extend to the mirror, comparative advantages of the two countries; near similar human capital development levels, low income levels and low natural resource endowments. Also similar are the barriers to growth, vast inefficiencies in government and elite capture; by the agro-military-industrial complex in Pakistan and by the agro-industrial elite in India. Both economies have benefited from adoption of the “open economy” model of growth since the mid 1980s. India more so than Pakistan, which has been constrained over the last two decades by its preoccupation with Afghanistan and its own war on terror-albeit some of it, of its own making. As Bhindrenwale was to Indira Gandhi, the Taliban has become for Pakistan; an out of control Tiger. The first casualty of insecurity is investment-both public and private-especially in infrastructure. Long payback periods are unsuitably risky if revenue streams become uncertain. More importantly, with the world increasingly in the “open economy’ mode, there are easier business pickings elsewhere. The 21st century belongs to growth in Africa and that is where business is rushing to be, both Indian and Pakistani. It is not surprising therefore, that trade between Indian and Pakistan is minimal and stagnant, relative to the total trade of both countries. Pakistan exports only 1% of its total goods to India and only 4% of its imported goods are Indian. Of course, the official data underestimates the actual trade through third countries and destinations. Both could benefit by cutting out the intermediaries margin and higher transportation cost of acceptable third party destinations. Non-tariff barriers on both sides; poor trade infrastructure and low financial integration make even the best cross border trade intentions die. Cross border investment is yet to be a reality. First, Pakistan estimates (Economic Survey 2013-14) that it loses up to 3% of its GDP due to insecurity, bleeding it of nearly one half of its potential GDP growth. For India, an insecure Western border is expensive. The geo-politics of Pan-Islamic militancy unsettles its domestic, plural aspirations. More generally, “including the poor” is a common challenge for both countries. The last thing, either could possibly want, is to add the cost of managing terror to that long list of unproductive, resource draining preoccupations. Second, India and Pakistan both gain by operationalizing the Turkmenistan-Afghanistan-Pakistan-India gas pipeline. This has been on the agenda for the last two decades and 2018 is the new aggressive target. Both economies are deficient in gas, a clean and versatile fuel for power generation, domestic use and industrial purposes. India loses 0.5% of its GDP every year due to shortage of peaking power capacity. Perversely, domestic coal supply shortages and the high cost of imported coal and LNG keeps installed capacity idle. The TAPI pipeline, would meet around 20% of our gas demand till 2030. Third, the lack of Pak-India economic integration provides a ready opportunity to China; the “big Panda in the room”, to deepen the economic “silos” with each integrated independently to China, but not to each other. This is already happening. Whilst trade between India and Pakistan stagnates, trade between China and Pakistan is booming, as is trade between China and India. Of course China is the world’s factory. It aggressively supplies price competitive goods, well suited to the limited pockets of developing countries. Chinese trade comes with generous financial outlays to develop and manage strategic infrastructure; Gwadar Port in Baluchistan (linking the Middle East to China in a trade and energy corridor) and the offer to build high speed railways and highways in India. Both Pakistan and India will accept much needed foreign capital and investment from anyone who offers it. That is the wise thing to do commercially. But it makes strategic sense to also develop alternative trade and investment opportunities in their “near abroad”. Infrastructure development is a great facilitator for growth. But it also has enduring legacy value. It determines the future spatial spread of growth and jobs along economic corridors. It is sobering to remember that Karachi Port is nearer to Delhi and Amritsar than is Mumbai. Democracy is great for transparency but is a killer for negotiations, strategic deals and moving on, which are best done in privacy. This is a limitation for PakIndia normalization. The history of distrust and animosity extends far beyond the cricket field. Babu led governments become hostage to the “agency problem”. The narrow self-interest of the managers drowns the real interests of those they represent. Progress can only come from “disruptive innovation” by leaders. It’s PM Modi’s call. A dash of Gujarati Dandia could spice up the frozen-in-time “Punjabi Tango” to produce results. Dandia and Tango is fine, but Kashmir to hum dene se rahe, aur woh chorhne se. Besides do we want to fully engage with a country whose biggest and best export is terror.